It’s been 15 years since I completed the Maryland Rider Training Program and got an M2 added to my driver’s license. That training was thorough and tough. But, boy, it was rewarding, and it’s fun to ride. With all the snow we’ve had across the country this winter, I sympathize with the frustrated motorcycle riders longing for a break from the cold and to get back on the open road. Your bikes are likely in storage or in the garage or at the various bike shops awaiting repairs and preparation for when you will take them to the streets. Be assured that while you may not be on your bike during these winter months, you’re not forgotten. There are many motorcycle safety advocates working hard to ensure your highest level of safety when you mount your bikes for that first ride of the season. As Evel Knievel, an American icon in extreme sports wrote, “Riding a motorcycle on today’s highways, you have to ride in a very defensive manner. You have to be a good rider and you have to have both hands and both feet on the controls at all times.” Knievel is right. But as I learned in my training, it doesn’t stop there. It’s also important to wear proper protection. 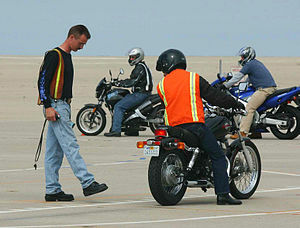 Our goal at the NTSB is to make the riding experience safer, save lives, and reduce injuries. In the last decade, more than 50,000 riders have died in motorcycle-related accidents. That’s far too many. That’s why we do safety studies and issued a series of recommendations for states to enact laws to ensure riders wear the proper protection, most notably a DOT-compliant helmet. And that’s why we are highlighting occupant protection for motorcyclists and all other forms of transportation on this year’s Most Wanted List. We care about your safety and your life; we want you and many more people to live to ride another day. Riding season is coming soon, but it’s never too early to start thinking safety. Never too early to shop for that helmet, leather gear or take a refresher course. As you prepare your bikes, consider what steps you and your team of riders can take to make the ride even safer. Let’s make this year the safest motorcycle riding season ever. Nicholas Worrell is a Safety Advocate in the NTSB Office of Communications. Yesterday we wrapped up four days of NTSB activities at Heli-Expo in Anaheim, California. These last few days, the NTSB has been talking about improving safety through realistic training scenarios, best practices for maintenance employees, safety management in helicopter emergency medical services (HEMS) operations, and getting a flight recorder in every helicopter. 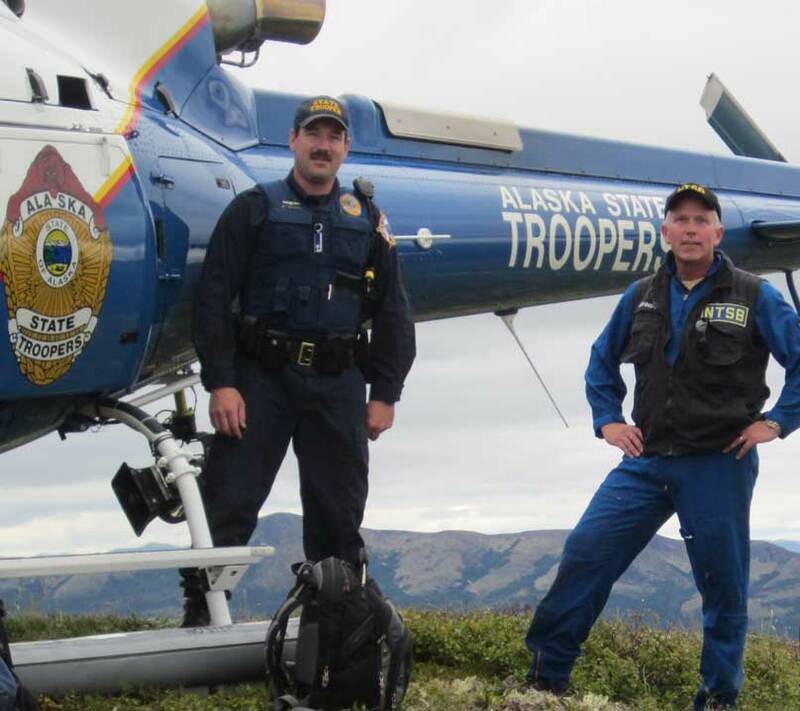 Improving the safety of helicopter operations is on our Most Wanted List in 2014 and at the Expo we’ve worked to present the “lessons learned” from past helicopter accidents. I spoke at the Helicopter Association International’s (HAI’s) “Salute to Excellence” awards, where Chris Horton, manager of flight operations at Guidance Aviation, took home HAI’s AgustaWestland Safety Award, in part for his work fostering safety management systems. Chris is a rising young star in the “safety first” school of thought in helicopter operations. I shared with the audience my top ten list of why I love helicopters. I recalled the many jobs I have seen helicopters do – such as when I watched a Skycrane helicopter lift the 18-foot, 15,000-pound Statue of Freedom from the top of the Capitol dome with care and precision, then set it gently on the ground. I have ridden on helicopters surveying a pipeline spill in Michigan and a hazardous materials train derailment in South Carolina. I have ridden along with Customs and Border Protection working along the southern US border, and with law enforcement doing their job over Los Angeles. Helicopters go where no other aircraft go, and they do jobs no other aircraft can do. Helicopters get the job done. As we toasted the best of the rotor world at HAI’s Salute to Excellence, I couldn’t help but think about some of the Vietnam-era pilots in the audience. Had any of them flown search-and-rescue missions in a Huey in 1966… when a young pilot ejected from his F-100 after it was hit by Viet Cong ground fire over the Mekong Delta? He was 50 miles away from the closest friendlies and he needed a miracle; it came in the form of a Huey with 50 caliber machine guns on each side. The crew hovered over him, he crawled up on the skids, they pulled him in and got out of there with the gunners in the doorway returning fire. That helicopter crew did a job that nobody else could do! So, my very personal thanks for getting that job done. That young pilot was my dad. This year, we at NTSB, are committed to addressing unique characteristics of helicopter operations so that helicopters can get the job done more safely. So congratulations to Chris Horton and to all of HAI’s Salute to Excellence award-winners. And congratulations to HAI on an informative and safety-minded Heli-Expo. Today I had the honor of representing the NTSB at a hearing before the Subcommittee on Railroads, Pipelines, and Hazardous Materials in the U.S. House of Representatives. The topic of the hearing was passenger and freight rail safety, an issue of the utmost importance to the NTSB. My testimony emphasized that any comprehensive approach to improving rail safety must include Positive Train Control, also called PTC. PTC is designed to protect trains from human error. If an engineer attempts to operate past a red signal or operate too fast, a PTC system intervenes by stopping the train before a crash or derailment occurs. Simply put, widely-implemented PTC has the potential to prevent crashes and save lives. Sadly, there are many real-world examples that demonstrate the need for PTC. For example, in September 2008, a Metrolink commuter train collided head-on with a Union Pacific freight train in Chatsworth, California. Twenty-five people were killed in that crash, and more than 100 more were injured. The NTSB’s investigation revealed that the engineer was texting while operating the train. He ran past a red stop signal and crashed into an oncoming train. The NTSB determined that PTC would have prevented this deadly crash. In the aftermath of that tragedy, Congress enacted the Rail Safety Improvement Act of 2008. The Act requires each Class 1 rail carrier and each provider of regularly-scheduled intercity or commuter rail passenger service to implement a PTC system by December 31, 2015. I’m pleased to report that progress is being made toward this lifesaving goal. Just last week, Metrolink became the first commuter rail system to implement PTC, when it began a revenue service demonstration under the authority of BNSF Railroad. While this is just a demonstration project, it certainly is a start in the right direction. Metrolink reports it will be implementing PTC fully throughout its entire system before the Congressionally-mandated deadline. Earlier this month, I visited a large Class 1 freight railroad to get an update on their progress toward implementing PTC. I walked away from that meeting believing this railroad is firmly committed to the project. That one company alone has invested more than $1 billion in PTC, adding over 1000 workers to devote to the project, beginning the enormous effort of retrofitting locomotives, training train and track maintenance crews, installing trackside equipment, and developing elaborate computer networks to allow PTC to work. In spite of the commitment by this railroad and others, however, an August 2013 Government Accountability Office (GAO) report to the U.S. Senate indicated that the majority of railroads will not complete PTC implementation by the 2015 deadline. There has even been talk of extending the deadline, despite the seven year timeline provided by the original law. As I noted in my testimony today, while NTSB commends the enormous and costly implementation efforts being made by many, we realize that for each day that goes by without PTC, the risk of more PTC-preventable accidents remains. That point was driven home again on December 1, 2013, when a Metro-North commuter train derailed in the Bronx, killing four people and injured dozens of others. While the exact cause of the accident is still under investigation, we do know the train entered a curve at approximately 82 mph, where the maximum authorized speed was 30 mph — in other words, something that PTC would prevent. It is because of our investigations of accidents like this – and 24 others in the past decade that could have been prevented by PTC – that the NTSB would be disappointed by any delay in PTC implementation. Implementation of PTC is needed now, not later. Lives depend on it. As a fixed-wing pilot, I am fascinated by the similarities and differences regarding the challenges and issues faced by fixed-wing pilots and helicopter pilots. That’s why I thoroughly enjoyed introducing the session yesterday entitled NTSB: Lessons Learned from Helicopter Accidents at the 2014 Heli-Expo in Anaheim. 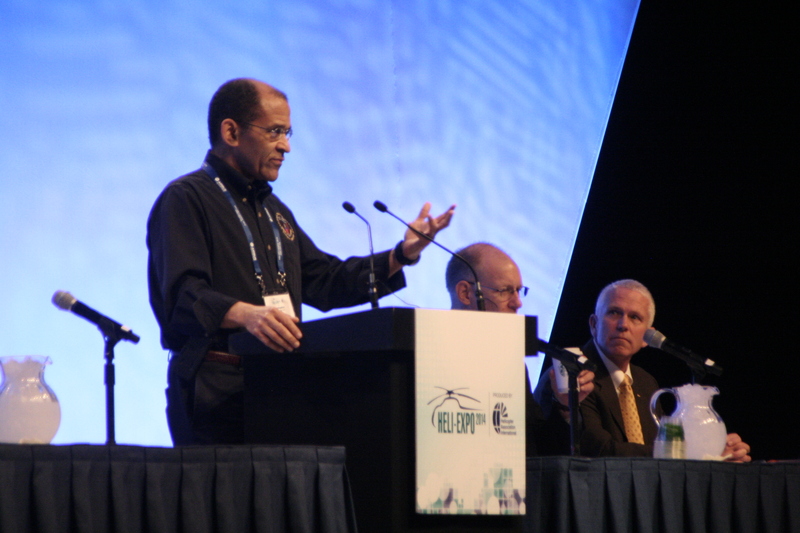 In this session, NTSB Air Safety Investigators presented findings, conclusions, and recommendations – based upon several helicopter accidents – regarding the need for improved helicopter maintenance and maintenance inspection procedures; the importance of better pilot training, especially regarding autorotation procedures; and the importance of flight data recorders in helicopters, not only for improving safety in general but also for enhancing our ability as investigators to determine the causes of crashes. The panels included industry experts who shared their own thoughts and experiences regarding these issues. Immediately after the Lessons Learned session, I also had the opportunity to participate in HAI’s launch of its Land & LIVE project. Every pilot expects to land safely at his or her final destination, but when, for whatever reason, reaching the final destination becomes questionable, helicopter pilots have many more opportunities than fixed-wing pilots to land safely, short of their destination. Land & LIVE will hopefully encourage the industry to consider it not only acceptable, but desirable, to make a precautionary landing in order to avoid the possibility of a tragic outcome – both for those on the helicopter and for those on the ground. I am optimistic that this common-sense approach to in-flight problems can improve helicopter safety by reducing the widespread reluctance to make precautionary landings. Helicopter safety has improved over the years, through the combined efforts of many in the industry, but our Lessons Learned session demonstrated that more needs to be done to continue improving safety in this very important and very unique industry. For more information on the NTSB’s efforts to Address the Unique Characteristics of Helicopter Operations, please visit our website: www.ntsb.gov. Nearly 100 years ago, in March 1914, a boy who would grow up to be described as the cornerstone of the commercial helicopter industry was born in Monticello, Iowa. Known to his family and friends as “Rick,” Jim Ricklefs’ interest in aviation began at a young age. He completed pilot training while in his teens, and in 1933, at 19, he soloed for the first time from an airport on the campus of Stanford in a Fleet Model Two biplane with a tailskid and no brakes! Rick’s interest in helicopters began in the early 1940s when he first saw the Landgraf machine, an aircraft created in one of many backyard helicopter projects in the Los Angeles area. He was so impressed by this machine that he went to work for and later became the Vice-President for Landgraf Helicopter Company. In 1948, he started his own helicopter company, Rick Helicopters in San Francisco, and then purchased Alaska Helicopter, in Anchorage, whose main business was surveying land in Alaska. Also in 1948, on December 13, Rick and a handful of other helicopter operators met in Burbank, California to form a helicopter association for collective benefit. It’s been said that the group was so small that they could have held their first meeting in a Sikorsky S-55 or a Piasecki HRP-1. The group initially chose the name of Helicopter Council, but changed the name the following year to California Helicopter Association. The purpose of the association was to disseminate helicopter information, organize promotion of the helicopter, provide mutual assistance, and facilitate the exchange of technical information. In 1981, the name was changed to the Helicopter Association International, or HAI. Today, nearly 70 years later, HAI fulfills its mission to provide its members with services that benefit their operations and to advance the international helicopter community by providing programs that enhance safety, encourage professionalism and economic viability while promoting the unique contributions vertical flight offers society. I’ve known Rick almost my entire life. In 1966 he sold Alaska Helicopter, to my stepfather, Rex Bishopp, and soon after the family moved to Alaska. I grew up around helicopters and eventually went to work for the family business. I served as a pilot and in management positions for Alaska Helicopters until the company was sold in 1995. Growing up in the helicopter community meant yearly trips to the HAI annual meeting, now known as Heli Expo. My family attended every year, beginning in 1967 when I was just a kid. Forty-seven years later, I’m still attending Heli Expo, though now it’s part of my role as the Chief of the Aviation Safety Anchorage Office for the National Transportation Safety Board. Tomorrow I’ll be presenting a session called “NTSB: Lessons Learned from Helicopter Accidents.” Along with my fellow NTSB investigators Kristi Dunks, Aaron Sauer, and Jim Silliman, we’ll talk about recent NTSB investigations into helicopter accidents, as well as NTSB recommendations related to helicopter maintenance, pilot training, and flight recorders. These issues aren’t just important to me, as someone with a long history in the helicopter community; they are a priority for the NTSB. 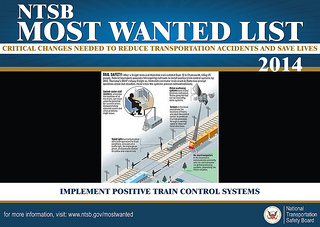 In fact, the issue of helicopter safety is one of ten issues on the 2014 NTSB Most Wanted List of transportation safety priorities. I’m looking forward to another Heli Expo, where this year we’ll help Jim Ricklefs celebrate his upcoming centennial. Rick has seen a lot of changes in the aviation world since he first climbed into a cockpit. Aircraft are safer and pilots are better trained, but there is still room for improvement. I hope that when I’m celebrating my 100th birthday (and attending my 83rd Heli Expo) in 2060, that I can look back on a legacy of even greater safety for all types of helicopter operations. As an Emergency Medicine physician, I have witnessed first-hand the horrible consequences of substance-impaired driving, from minor injuries to multiple fatalities. I also understand all too well the frustrations that can occur when trying to test crash-involved drivers for alcohol or drugs. Laws and practices vary significantly from state to state on who can test a driver’s blood; when and where blood can be tested; what substances are tested for; and how test results are reported and used. Often, injured but surviving drivers aren’t tested at all, and these are the ones who may drive again. This means that information about substance-impaired driving crashes isn’t as consistent or reliable as it could be, making the fight against this deadly problem more difficult. After all, how can we find a cure if we can’t properly diagnose the disease? In November 2012, the NTSB made several recommendations that focused on the collection of data about substance-impaired driving. At first glance, collecting data may not seem that important when it comes to getting impaired drivers off the road. But as a doctor and researcher, I know that without high-quality data, it’s impossible to identify and evaluate solutions to any problem. If I don’t have a reliable way to measure the temperature of my patients, I can’t accurately diagnose them. Similarly, if we don’t have a way to reliably measure aspects of impaired driving, we can’t implement the right countermeasures to fight the problem. States work to achieve BAC reporting rates of at least 80% of fatally injured drivers and at least 60% of surviving drivers involved in fatal crashes. When implemented, these recommended actions will significantly improve the quality of information about substance-impaired driving, leading to better, more appropriate countermeasures. On Monday, I had the opportunity to speak about these data-related recommendations to the Alcohol, Drugs, and Impairment Division of the National Safety Council at its meeting in Seattle. Like the NTSB, this group makes recommendations for addressing substance-impaired driving, including recommendations on legislation, enforcement, education, chemical testing equipment, training of testing personnel, and other aspects of alcohol countermeasures programs. Our hope is that by working with groups like this one, we can build support for our recommendations and see life-saving actions taken more quickly. I’d really like to go the rest of my Emergency Medicine career without ever seeing another death or injury that resulted from substance-impaired driving. I also know that’s not likely. It’s going to take time to eliminate this deadly problem from our highways. But I believe that with better data to diagnose the problem, we will eventually find the cure. Dr. McKay is a Board Certified Emergency Medicine physician with almost 20 years of academic experience doing transportation safety and injury prevention research – in addition to teaching medical students and residents and taking care of patients. She came to the NTSB in December, 2012 as the Chief Medical Officer. In the predawn hours of August 14, 2013, UPS flight 1354, an Airbus A-300-600, crashed while on an instrument approach to Alabama’s Birmingham-Shuttlesworth International Airport. Both crewmembers were fatally injured and the aircraft was destroyed.